Navigating to open clusters with a red dot finder is difficult. Many are some distance from a visible bright star – bright is magnitude 4 or more around here – and an Alt-Az (Altitude–Azimuth) mount is next to useless without an optical finder under these conditions. When double star hunting I usually prefer my Equatorial mount, and I think it’d be the best tool for the open clusters program too. Heavy though it is, once aligned it’s much easier to find your way around using the slow motion controls for RA (Right Accession) or Dec (Declination) whilst looking through the eye piece. For example, lets assume I’m trying to find NGC1662. There’s not much nearby that’s brighter than magnitude 4, but I could find it using Meissa (lambda Ori), which is magnitude 3.5, and my RA control. First, use the lowest power eye piece in the box. Trying to find things at high power is usually a bad idea. Meissa is bright enough to use my red dot finder, and once in the view I use the RA control to move the mount towards the celestial West in the direction of the blue arrow. Remember the eye piece? 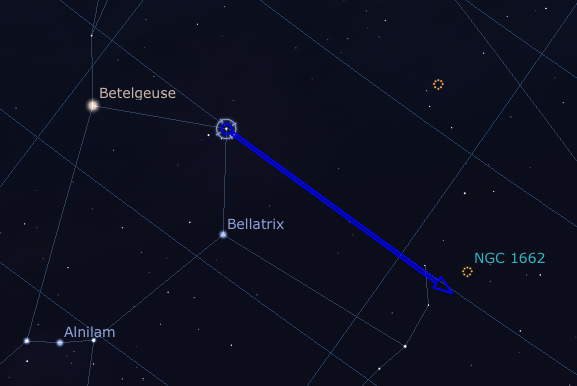 Mine has a field of view of about 2.4 degrees in my reflector, and Meissa is about 1 degree south of NGC1662, so it should be visible in the eye piece as it passes by… as long as I know what it looks like. I could even stop when that bright star at the top of Orion’s bow appears and centre the scope on that before continuing. That’d move me towards my target and make it easier to spot. That’s how you begin star-hopping around the sky.